Helianthus or “sunflower” is a genus of plants comprising about 70 species, nearly all of them native to North America. 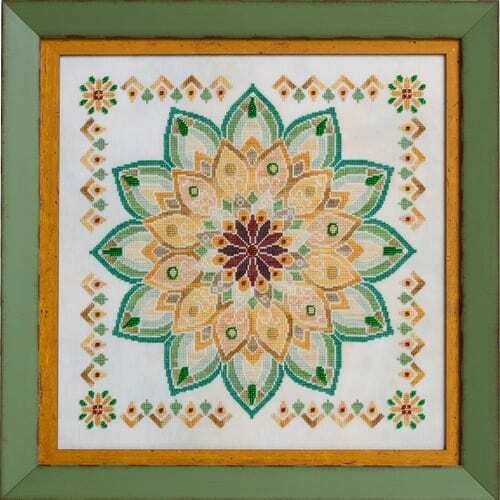 Helianthus is the first release in the new Floral Mandala Collection from Glendon Place. I am very excited about this new collection and look forward to creating more colorful design interpretations of the world’s most beautiful flowers. Fabric: Stitched on 28ct Tyco Cashel Linen provided by Picture This Plus. Suggest purchasing a fat quarter (18″ X 26″). Glendon Place does offer this fabric on the website as a fat quarter (18″ X 26″). Purchasing a fat quarter will work sufficiently, but will only allow 2″ of selvage on the right and left sides. The model was stitched suing a fat quarter and there was plenty of selvage from framing. Materials Summary: Uses 11 colors (13 skeins) of Dinky Dyes hand-dyed silk floss, 5 colors of Mill Hill Beads, and 1 color of Sullivans/DMC/Anchor for attaching beads. Comparable Sullivans/DMC/or Anchor colors ARE NOT provided for this design.